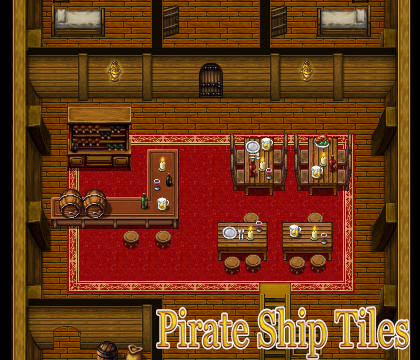 Pirate Ship Tile Pack | Create Your Own Game! Sail across the seven seas in this exciting new tile pack! Ahoy, mateys! Are you ready for sailing, plundering and drinking rum? A smooth, painterly style like the one you'll find in Casino, Valentine's, Winter Wonderland, Sci Fi, Halloween, Evil Castle, Royal and Dungeon & Volcanoes tile packs. 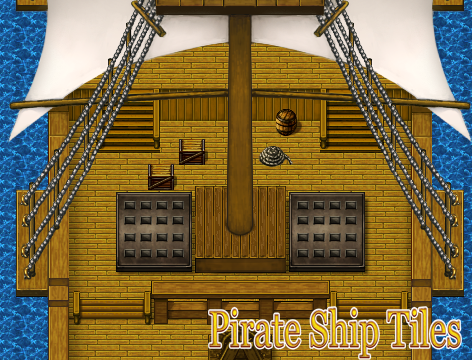 Large and detailed pirate ship, with a deck, mast and sails. Insides of pirate ship, with multiple decks, furnishings, canons and navigational tools. Pirate hidden cove elements, with a cave for hidden treasure, dock, animated boat and more.